The Future is here! In edible water containers! I think we can all agree that the amount of plastic bottles floating about in the sea is a massive problem. 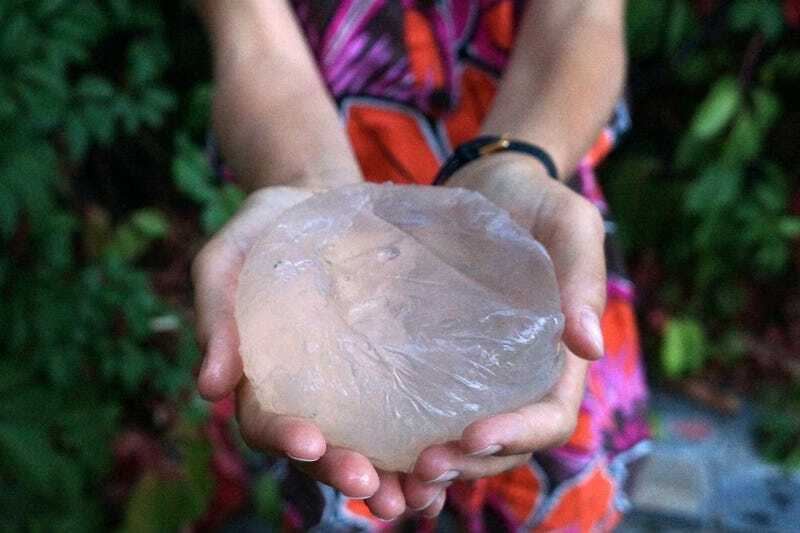 An edible or biodegradable alternative means of transporting small amounts of drinking water would be perfect! Ooho, photoed above, is just that. Even better, it's licensed under Creative Commons, so you can knock out your own at home! It sounds like a fantastic idea, but I do have a few reservations. One, being addressed by Ooho, is that the capsules aren't resealable. So either you need lots of little capsules or to chug everything you drink. My other concern, looking at the capsule, is opening it in the first place. Do you tear it? Pierce it? Bite it? I'm sure Ooho have tried this and it works. It would be a fairly major oversight if they haven't. But it looks like you would open it and then it would flop to one side and the entire contents would fall out, inevitably straight onto your crotch. It's not there yet, but this seems like a great concept. I can't wait to see how it progresses.